St. Martin/Maarten is the only destination in the French West Indies that can truly lay claim to a tax-free status. With no customs duties, VAT or other indirect taxes to pay, the island offers unbeatable prices on a whole host of items. Prices marked on merchandise are typically firm, though at some small shops, some bargaining can take place with the owner. Prices are quoted in euros or USD, and all salespeople speak English. Travelling in the off-season (April 15 � December 15) means dramatic discounts are available, and include discounts on designer items. Most French St. Martin stores keep normal western hours, but keep in mind that many close to take an extended lunch break from around 12:30 pm to 2:00 pm. During high season, become familiarized with when the cruise ships are in port, as this increases foot traffic in the shopping district, and may reduce the amount of attention shoppers can receive in each shop. Wednesdays are the busiest day, with close to 8 world-class ships in port. Saturday is the best shopping day, but on Sundays you may find some stores closed. The Caribbean has always been a popular spot for adding to one�s jewellery box. St. Martin/Maarten is certainly no exception, with top companies such as Tiffany & Co, Cartier, David Yurman, and Herm�s. Both the French and Dutch sides have many fine jewellery stores, with Philipsburg being a popular stop. Take your time and shop around. Also be sure to mention you are not travelling on a cruise ship, as this notifies the salespeople that you have time to do your research to get the best price. On the Dutch side of the island is Philipsburg� a shopping haven. Many independent boutique shops directly import European fashion directly from France and Italy. There the shopping diva can find Tommy Hilfiger, Max Mara, Cartier and many more. Watches and handbags draw many shoppers, and include name brands such as Coach, Bvlgari, Herm�s, Cartier, Swatch, Rolex, and even the most indulgent Patek Philippe! This area welcomes the cruise ship passengers, and provides many choices. St. Martin, the French side, also offers the choice of many top stores such as Escada, Lacoste, and Longchamps (to name a few) in Marigot at the West Indies Mall. Klass Electronics in Philipsburg is a popular destination for family with teenagers. Cameras, tablets, laptops, audio equipment and games. Kids will love the Beats headphones� and so will parents! The absolute latest in technology. For art collectors, Sir Roland Richardson has a gallery featuring paintings of his Caribbean homeland, which have become true symbols of the region's beauty and rich culture. Sir Richardson�s family has been on the island since the 1700s. Sir Roland Richardson was knighted by Queen Beatrix of the Netherlands in 2007 for his lifelong artistic contribution to his community. He has also received a Life-time Achievement award from the French Government for his work. Beautifully appointed MAC Caribbean villa Jardin Creole awaits the discerning visitor looking for a little piece of heaven in St. Martin. Located on 2.5 acres in the exclusive Terres Basses area and just a 3 minute walk from Plum Bay Beach, this luxurious 5,000 square foot villa offers generous Caribbean Sea views and ensures a tranquil oasis to allow you to recharge and relax. 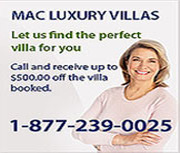 Look no further than MAC Caribbean for your vacation rentals. Let us help you relax in style.